If you're not sure where to start with your nursery decorating project then this e-course is for you! Boy, girl or gender neutral? After following my simple step-by-step approach to choosing your nursery design, you should have a good picture in your mind of the baby room you want to create and you'll be raring to go! So save yourself time and headaches and sign up today - You'll be glad you did! Looking for more detailed information? 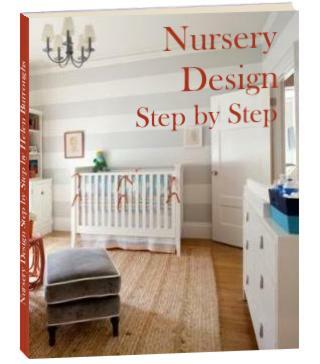 Then you should check out the full guide: Nursery Design Step by Step. The full guide expands on the sections covered in this course and includes many others. And best of all it includes over 100 full-color nursery pictures! Remember to share this find with a friend! Help me get the word out about this fantastic free resource by sending an email to your friends with a link to this page or if you have a blog or website, pop over to my share this site page and grab a button for your site.